Start by setting the seat pan height so that feet are flat on the floor (or footrest if needed). Check to determine that there is no pressure on the back of the knees. To make sure of this you should have 3-4 fingers' space between back of knees and edge of chair. If the seat has a seat-tilt adjustment, adjust the seat tilt to a position that is comfortable for the task, such as slightly downward for keyboarding. Then, adjust the backrest tilt, if you can, to an angle that supports the back while sitting upright between 90 and 120 degrees. If the backrest can be adjusted for height, move it through its lowest to highest range to find a position that puts firm pressure on the low back and supports the natural “S” curvature. Adjust the armrests to fully support the arms and relieve pressure from the neck-shoulder area with out elevating the shoulders. Some armrests can be positioned closer and farther from the body. 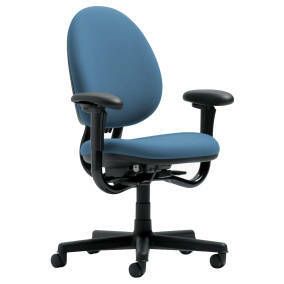 If so, find the appropriate position to fit the body type of the person using the chair and the work being performed. The armrests should not interfere with arm movements during tasks. After the chair adjustments have been made, observe the person's position while performing job tasks. It may be necessary to make adjustments to workstation and/or further adjustments to the chair.